Making : it easier to figure out which way up my new pad of Post Its is. Unless I mark the sticky edge out, I can be guaranteed to start writing the wrong way on them so that I end up sticking my note 'side on' rather than right way up. Cooking : soup. Lots of soup. I'm never going back to canned or premade from the refrigerator aisle. Drinking : tea. Mugs of it to stay warm. I'm pretty sure pure, strongly brewed tea courses through my veins each winter instead of blood. 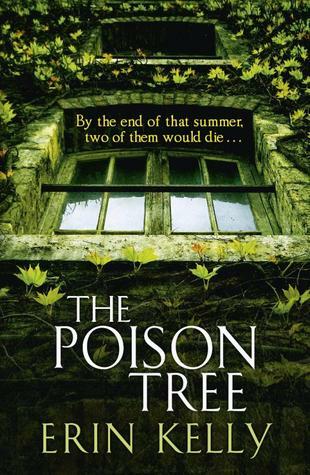 'The Poison Tree' tells the story Karen, a brilliant linguist who befriends the mysterious brother and sister duo Rex and Biba at university. Bored stiff by her well-connected roommates and stifled by the pride her working class parents have in her, Karen doesn't think twice about breaking ties with her old life to move in with Rex and Biba in their dilapidated mansion. Karen is entranced by both Rex and Biba. She soon falls blindly in love with everything about them both. It proves to be a blind love with devastating and far reaching implications for them all. The narrative shifts in time between the golden summer the three spent together before it all went awry and the present day, some twenty years later where Karen is mother to Alice and wife of Rex who has just been released from prison. In typical Kelly fashion, half the thrill of reading 'The Poison Tree' is discovering just how Rex came to be imprisoned and just what happened to Biba after the death of her drug running lover. And then there's that unshakeable sense that all is not what it seems in the level headed Karen's current life as mother, wife, breadwinner and protector. Trawling: yoga websites for more neck and shoulder healing exercises. What I've found seems to be working well so far. I'm being quietly amazed at just how therapeutic exercises and stretches can be. Wanting: to wear my ugg boots out of the house. Looking: at my desk and realising it needs a bit of a declutter. Deciding: that I'll never iron on a name label again now that I have a clothing stamp for Preschooler SSG. Wishing: that time could stand still for a while whenever I wanted it to. Preschooler SSG starts Kinder next year and the preparation talks are already starting at preschool. I'm not ready!! Enjoying: the crisp air on my face in the morning as I run. It always invigorates. It's just getting out from under my doona beforehand that's the challenge. Waiting: for my turn at Snakes and Ladders. It's Preschooler SSG's favourite board game. Liking: 'attending' work webinars from home. While the presenters spend the time between sessions ironing out tech issues, I potter around the house folding laundry and stacking the dishwasher as I mull over the previous session's take home messages in my head. Wondering: what I'll do for my birthday next month. Loving: those Nina Proudman daydream moments that my life gets graced with every now and then. Pondering: a life without Coke Zero.... it's been pulled from the Australian market. Listening: to anything and everything via my MINISO bluetooth speakers. One of my best tech buys in recent memory. Considering: the possibilities for our next family holiday. Buying: milk. We seem to get through it rather quickly these days. Watching: Preschooler SSG help his Thomas trains participate in our game of Snakes and Ladders. Hoping: we get through the rest of winter mostly healthy. Marvelling: at how dill and salmon were just made for each other. Cringing: at my roots. I really, really need my next hairdresser's appointment. Needing: my hairdresser. See above. Questioning: old attitudes and mindsets. And changing them. Smelling: that musty plaster smell of micropore tape. I have some wrapped around a cut on my thumb and the smell is disseminating widely. This one's from J Crew and matches my new dark denim cropped trousers perfectly. I like the contrast in fabric and style the two pieces have. I also remember that jeans and Chanel -esque jackets were a thing in the early 90s. If you lived it the first time something was a trend you are entitled to work it however you see fit when it's resurrected the next. Noticing: the bareness of the branches of our street's trees. Knowing: the difference between giving to the people you love and loving the people to whom you give. Thinking: about the future and its possibilities. Admiring: my empty laundry basket. Getting: tired. It's nearly time for bed. Bookmarking: a news article by mistake. Oops. Better go and edit my bookmark bar. Opening: a new tubn of yoghurt. Closing: the door behind me as I go about putting the house into sleep moder for the night. Feeling: accomplished. I singlehandedly got the video conferencing equipment to work for a meeting on Monday. Wonders never cease, people. Wonders never cease. Hearing: the roll of dice on a board game. Yes, we are still playing Snakes and Ladders with the Thomas trains. Celebrating: Monday (rather then dreading it Sunday night before being dismissive of it for the entire day). I'm trying a new approach to the first working day of the week. We only have seven days to a week and to give up on one on a routine basis seems like such a waste. I wonder how long this will last? Pretending: that I get the hours of sleep I'm meant to each night. Spendy cosmetics aid and abet. Embracing: my new Keep Cup. Doing my bit to reduce landfill while not depriving myself of my regular skinny caps. I did declutter my desk a few weeks ago...and it has since turned into another dumping ground. Sigh. Why don't magical fairies clear my desk for me? Yes to the Yorkshire tea! I've got a box in my cupboard that's been getting quickly depleted this weekend. I never knew that you could get name stamps for kids clothes! Winning! I love making a good soup too... although I'm not sure that I'll make the 'never again' statement about supermarket soups. I love that jacket. Sadly I can relate to the messy desk and I'm decluttering mine when I finally take the plunge and remove my iMac from mine at home. I'm not with you on the soup front though as I find soup amazingly unfulfilling as a meal option. I'm not sure why! There is a memoir called "How to dress a dummy" by Cassie Lane. I want to read it. I think you would enjoy. Perhaps a trip to Melbs is in order, for your birthday? I'm on holidays as of today, so that book looks very interesting. I'm always on the look out for a new author... I've never heard of Erin Kelly! So much to love in your post this week. I'm a Nina and Offspring fan too! Love the boucle jacket and what a great idea with the post it notes! Have a great week and take some time to enjoy. There's nothing wrong with wearing Ugg boots out of the house! Some may say there is, but Canberra weather often demands it. I say GO FOR IT! I can't make a decent soup so no to that from me. Yes to Nina although I'm on series 2 on Netflix. I'm reading The Swimming Pool. You might like that. Definitely soup weather. I'm all about tea drinking as well. Love the jacket! I really need a keep cup now I'm back at work! Time really does fly with the little ones - I'm always so unprepared for how fast everything goes even though I've had a few years of it now, I don't think you can ever prepare yourself for how fast they grow up!